The FCT Minister, Malam Muhammad Musa Bello, has called for improvement in the volume of electricity supplied to the Federal Capital Territory from the national grid to effectively power critical infrastructure in the capital city. The Minister made this call while receiving the new Managing Director, of the Transmission Company of Nigeria (TCN) who led the company’s management team to the Minister’s office on a courtesy call. Malam Bello who stated that the 11 percent electricity allocated from the national grid to the FCT and other neighboring states covered by the Abuja Electricity Distribution Company (AEDC) is grossly inadequate, called on the TCN to allocate more power to the Abuja Distribution Company with specific instruction that the extra power should be dedicated to the Territory. According to him, “Powering the city’s critical infrastructure like the streetlights, the hospitals, water treatment plants and the entire waste management value chain, especially the liquid waste management has been a big challenge with epileptic power supply. We have been faced with a number of options, some which include just going off grid. But we realize that going off grid, the immediate solution will be using fossil fuels, putting generators all over the city and of course that affects the environment critically”. 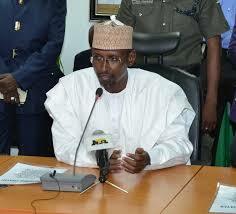 Malam Bello explained that the FCT’s geometric expansion has exceeded all plans and expectations; saying, “it is very clear even from our data and your records that the way in which the city has been expanding within the last two decades, we are talking of an area with a population running into six million already which is overstretched”. The Minister who recalled that a special arrangement around the Katampe area which existed some years back took care of power supply to the FCT, called for a return of such projects to tackle the problem of power shortages in the capital city. The Minister noted that in the alternative, “We could also identify a system where you can run the streetlights directly from your facility and we are willing to pay, so that that can be looked at as a priority project, independent of the distribution company because it’s priority for us. The seat of power of the country is in Abuja with the President, National Assembly, the highest courts in the land as well as the diplomatic community are all here. This is the centre of Nigeria. We cannot afford to leave Abuja to be dark at night”. He tasked TCN to look at specific areas in the Federal Capital City like the Central Business District, the Three Arms Zones, the hospitals and the security zones; emphasizing, “I don’t know what the legal implication will be but you could look at it under national security to find ways to solve that”. Malam Bello revealed that recently the FCT Administration released the sum of N500 million to the AEDC being part payment of its bills; stressing that FCTA has been very punctual in paying its electricity bills since he assumed office. Malam Bello stressed that the FCT Administration believes that power is a critical social infrastructure that every government has to support and assured them of his support and cooperation. Speaking earlier, the Managing Director of the Transmission Company of Nigeria, Mr. Usman Gur Mohammed appreciated the warn reception of the Minister. He promised that TCN in collaboration with the National Electricity Regulatory Commission (NERC) will look into the request for more allocation of power to the Abuja zone; saying that his company is presently working on the possibility of bringing in additional power lines through Lafia, Nasarawa State into Abuja. The Managing Director disclosed that currently TCN transmits power into the FCT through Gwagwaglada and Suleja axis but would make it a tripod arrangement with Lafia axis being added.